Tree of Codes by Jonathan Safran Foer is, in many respects, an artist’s book that experiments with the material possibilities of print. It was published by Visual Editions in 2010, using the die-cutting technique to create a book that is sculptural and complex in nature. Each page cuts out various lines of text, leaving physical spaces in the paper through which the reader can see onto the next page, which then contains its own unique formation of text (see Figure 1). It reads like an experimental work since it very much occupies the grey area between poetry and prose. In actuality the text is from a book of short stories called Street of Crocodiles by Polish author Bruno Schulz. 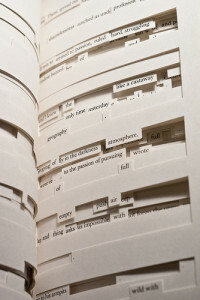 Foer then takes a pre-existing text and attempts to create a new piece by experimenting with the unique capabilities of the printed book and its encompassing technologies. The practicalities of attempting to represent this text in code seem beyond the scope of the required skills of the course, but I still wanted to blog about it because of the interesting thought experiment it poses. The main issue at the heart of rendering such a text in code would be around representing the space or negative space within a printed text, versus the screen. The problem then is that when you attempt to go down the path of encoding, the impulse is to focus on representing the content how it falls on the page using our traditional sense of what a page is. However the process of representing the text and space on any given page is not terribly different from marking up for regular prose, and the end result could easily be an accurate representation of the text but with its variety represented only in one dimensional space. The problem that then arises is that it leaves out the key structural feature of the book: the three dimensional space that is created by the depth of the cutouts in the book. The caveat of this book is really that it is an artist’s book, a book that is self-reflexive in nature and very much in conversation with the unique capabilities of print. Even its title reflects its dependency on paper. Rendering it in code would change the project completely. Trying to really stay true to representing the physical book in a digital format might then be more effective if it were to be simply photographed, and since I don’t have an e-reader, I wasn’t able to get a sense of how digital versions cope with this. On the other hand, the title is also in conversation with our understanding of language as “code,” and one could imagine the possibilities of the new values it could take on through the process of markup. Attempting to represent this text in code would be engaging with much of the same processes that Foer engaged with when he decided to take a pre-existing text and make it something new by drastically altering its physical structure. Coding this text seems like natural next step in the process of experimenting with the reader’s perception of a single text in various artistic formats. My group has discussed using concrete poetry as being a challenge to code, which is of course, because of the challenge of representing the way poetry plays with word placement and space. Tree of Codes looks at the same problem in multiple dimensions and would be doubly challenging, and to consider how to cope with that would be an artistic undertaking in and of itself. For that reason we won’t be pursuing it, but I thought it presented an interesting conundrum for considering something like XML. Foer, Jonathan Safran. Tree of Codes. Belgium: Visual Editions, 2011. Print.